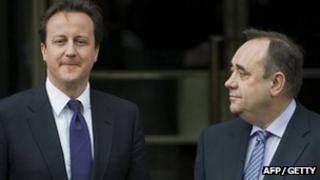 David Cameron has confirmed he will not have a TV debate on Scottish independence with Alex Salmond. The prime minister has written to Scotland's first minister rejecting his invitation for a head-to-head showdown. Mr Cameron said the first minister should instead face Alistair Darling, head of the pro-Union campaign group Better Together. Mr Salmond has responded by accusing the prime minister of being too afraid to face him in a live political debate. Mr Salmond had previously written to Mr Cameron urging him to taking part in a televised debate, arguing that the prime minister was so central in the campaign to keep Scotland in the United Kingdom that a refusal would be neither consistent nor credible. In his letter to the first minister, David Cameron agreed there should be television debates ahead of the referendum. He said Mr Darling, the former Chancellor, had been asked by all of the pro-UK parties in Scotland to lead the campaign, and that while it was entirely right for Mr Salmond to place himself at the head of the Yes campaign in favour of independence, he should not decide who should lead the No campaign too. The prime minister said: "It is a well understood and reasonable principle that you get to pick your own team's captain, but not your opponent's as well." He also said: "It is time for the two campaigns and the broadcasters to meet and start working to make these debates happen." Responding to the letter from the prime minister, Mr Salmond said he wanted a chance to counter the "spurious and unfounded claims" Mr Cameron had made about an independent Scotland and he argued the "best way" to do that was with a live televised debate. The first minister said: "The government in which Mr Cameron serves as prime minister is central to the entire referendum debate from the perspective of the No campaign. "I have noted the prime minister's apparent unwillingness to take part in another General Election debate and I'm sure people will draw their own conclusions from that. "Indeed, I believe his refusal to debate Scotland's future with me can be summed up in one word - "feart". In an interview with BBC Scotland, ahead of the Conservative conference which begins in Manchester on Sunday, Mr Cameron dismissed the suggestion that he was "scared" to face Mr Salmond in a debate. He said: "I used to debate with him when he was in the House of commons, but as I say it is not a debate between the leader of the Conservative party and the leader of the SNP. It is not a debate between the prime minister of the UK and the first minister of Scotland. "It is a debate between different people in Scotland about whether to stay or separate and that's where you have to hold the debate."